There are many reasons to visit Doodletown Road in Bear Mountain State Park, a jewel of a park in Rockland County, New York. Perhaps it is the history of Doodletown that interests you? Maybe you are hoping for an encounter with Crotalus horridus, otherwise known as the Timber Rattlesnake? Or could the steep uphill climb be what entices you out of your air conditioning? It certainly isn’t the poison ivy, deer flies, and mosquitoes that bring you to Doodletown Road though all three flourish in the friendly environs. But there is one reason better than any mentioned thus far and that is the sought after, sky blue, buzzy songed bird, the Cerulean Warbler. 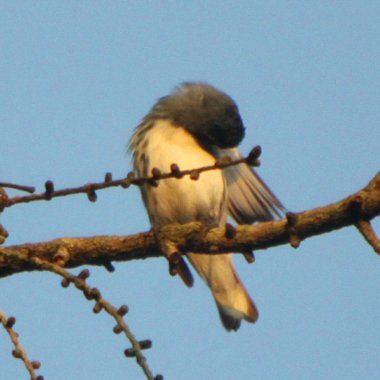 Previous visits in season have always netted me at least lousy looks at Dendroica cerulea* but on my most recent visit I wanted to do more than see and hear the bird: I wanted to get at least one decent digiscoped image. Impossible? Maybe. 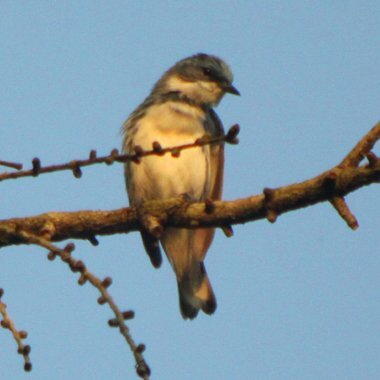 After all, the Cerulean Warbler is a small bird that makes its home in the canopy. Individual leaves are often larger than an individual bird and the difficulty of tracking a fast and small bird high above through thick foliage is not to be underestimated. So, of course, ten minutes into the hike up Doodletown Road I spotted a Cerulean Warbler perched in the open busily preening. I never got my digiscoping rig set up so quickly! But, obviously, the images I managed to get weren’t quite good enough. The twig going across the bird’s body was annoying so I moved to my right and, of course, as soon as I was about to take another shot the wood-warbler made a break for it and started foraging in some very thick foliage. I patiently awaited my next opportunity, tracking its movements through my digiscoping rig until it finally came mostly into the open again at which point I fired away as quickly as I could depress the shutter. The shots I got were a bit too dark but I like them anyway. 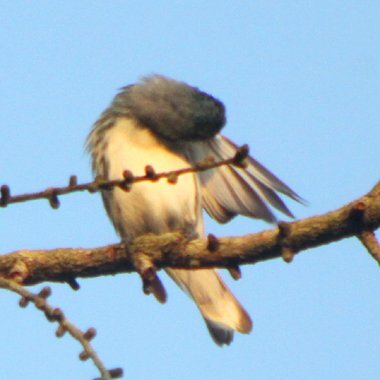 I think that they capture some small part of the spunky character of the Cerulean Warbler. I tried for more images but the bird had cooperated as much as it was going to. Fortunately Doodletown Road is long and I had a couple more opportunities at the total of ten singing male Cerulean Warblers I heard. The best of the few images I got is below. Looks like I will have to go back to Doodletown Road again next spring and hope for more cooperative birds! *Soon to be Setophaga cerulea. Orange You Glad To See Me?